Please note that color samples may appear different depending on your computer display settings. If color matching is critical to your application, please contact us for a color sample at 1-224-653-8181 or sales@pksupplies.com. Can I accelerate the curing process of Dow Corning sealants...791, 795, 790, etc? 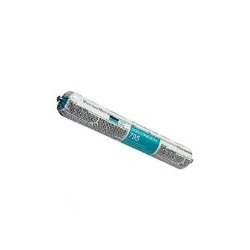 Dow Corning 795 silicone sealant sausage in a convenient sausage container consists of a single component, provides medium elasticity and is comprised of a neutral cure silicone architectural grade formula. Dow Corning 795 silicone sealer cures to a strong, yet flexible, silicone rubber joint seal and allows significant joint movement when applied according to the manufacturer's directions. This Dow 795 RTV architectural grade silicone caulking sealant easily applies in any weather and cures quickly at room temperature. Dow 795 sealant, comprised of non-sagging silicone material, cures to a medium-modulus silicone rubber when exposed to moisture in the air. The Dow 795 series sealants can withstand ±50% movement of the original joint area when installed in an adequately designed weatherseal joint. In a properly designed structurally glazed joint, the sealant is strong enough to support glass and other panel materials under high windloads.